Does your child love the ocean and dream of one day swimming with the dolphins? 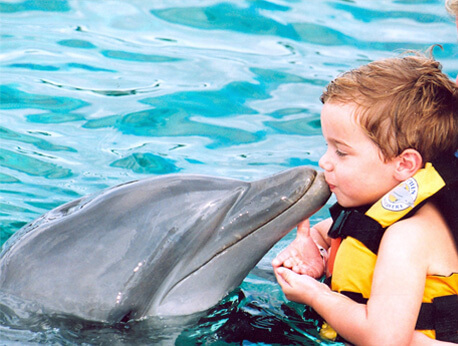 Our Cabo Dolphin Kids Program is designed for children ages 4 to 9 in mind. Make a memory of a lifetime by giving your child a chance to touch, hug, and even feed a dolphin. What 4-year-old doesn't dream of a chance to swim with dolphins? In our Cabo Dolphin Kids Program, your kids can get a chance to swim and play with dolphins in a fun and safe environment. This program is designed especially for kids ages 4 through 9 and provides an experience of a lifetime for children. Both educational and interactive, this program is perfect for children who want to learn and play. Playing with dolphins for any kid is a dream come true! After a brief orientation by our dolphin experts, the kids are then guided into the shallow water to interact with the dolphins. The shallow pool is safe, and the kids are closely supervised. Parents are allowed to accompany children to the poolside observation area but cannot get in the water or interact with the dolphins with their children. In the water, the kids can interact with the dolphins at their leisure. The kids are given as much swim time with the dolphins as possible, making this experience worth every penny. They can play, hug, touch, and sing with the dolphins. And, they are even given a chance to feed the dolphins. As they get to know the dolphins, they will surely fall in love and talk about the experience for years to come. This program lasts approximately 30 minutes with a brief 10-minute orientation before spending the rest of the time in the water with the dolphins. Because we keep our group numbers small, we are able to provide as much one-on-one interaction with the dolphins as possible. Both educational and interactive, our kids program is full of excitement and adventure! Does your young child have a love of the ocean and a desire to swim with dolphins? Call today to make your reservation, and make your kid's dream of meeting a dolphin friend come true! Why do we limit the number of sessions for people to interact with dolphins? At Cabo Dolphins, the animals' health and welfare are of primary importance. The sessions are limited to ensure an enjoyable schedule including a variety of activities for the dolphins. The dolphins spend only a combined total of less than two hours each day voluntarily interacting with the public. The rest of the day is allocated to the dolphins' private time, valuable training time, as well as play and social interaction. How many kids participate in each program?